Big Bear's unique boutique filled with vintage jewelry, pearl necklaces with jeweled pendants, gorgeous chokers, horn soldered bracelets, woven leather bracelets, fur coats, fur purses, fur boots, capes, clutches and so much more! Make Le Muse your stop for specialty hand-made items, with vintage adornments, sparkling jeweled accessories, and cozy fur-lined hats. You can now SHOP ONLINE! Browse our unique line of jewelry and clutches. More inventory to be added soon! All of the items are one-of-a-kind. Most are hand-made. If you've never visited our store in Big Bear, check out our About Our Store page to read more and see other photos. Check back often to browse our inventory for sale online and for specials and sales. Contact us if you have any questions. 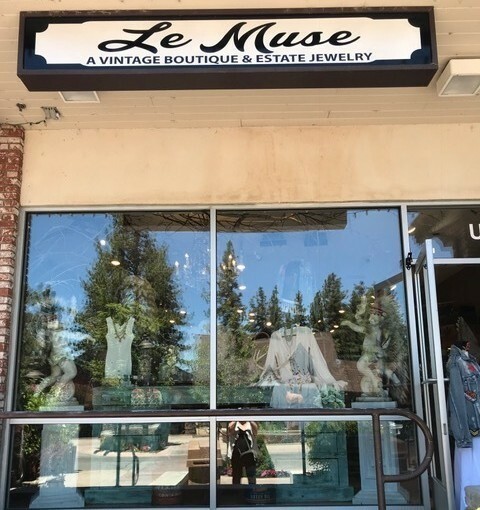 Le Muse Big Bear CA offers fine vintage, jewelry, clutches, fur coats, handmade items, unique accessories and more! Le Muse has been in business since 2013 and is centrally located in the heart of the Big Bear Village. It features an array of unique vintage jewelry, handmade jewelry, clutches, coats and so much more. Shop online or come visit us! Copyright ©2019 Le Muse. All Rights Reserved.